SparkSqlAstBuilder is an AstBuilder that converts valid Spark SQL statements into Catalyst expressions, logical plans or table identifiers (using visit callback methods). Spark SQL uses ANTLR parser generator for parsing structured text. 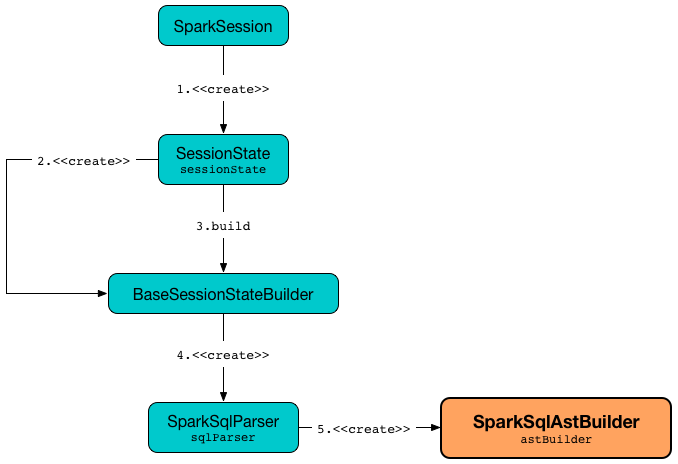 SparkSqlAstBuilder is created exclusively when SparkSqlParser is created (which is when SparkSession is requested for the lazily-created SessionState). SparkSqlAstBuilder takes a SQLConf when created. SparkSqlAstBuilder can also be temporarily created for expr standard function (to create column expressions). val sqlText = "ANALYZE TABLE t1 COMPUTE STATISTICS FOR COLUMNS id, p1"
visitAnalyze supports NOSCAN identifier only (and reports a ParseException if not used). NOSCAN is used for AnalyzePartitionCommand and AnalyzeTableCommand logical commands only. CacheTableCommand logical command for CACHE LAZY? TABLE [table] (AS? [query])? DescribeColumnCommand logical command for DESCRIBE TABLE with a single column only (i.e. no PARTITION specification). val sqlCmd = "DESC EXTENDED t1 p1"
val sqlCmd = "DESC t1"